I don’t know why I haven’t seen a pair of these before. They’re a pair of glasses that ingeniously fold into an ultra-low profile size. Once folded, the sidebars act as a case, so you don’t need to carry one separately, making them even handier. I don’t wear glasses, so I’m not sure how practical or comfortable they are. I’m not even sure if they will fold when you are wearing them, but I’m sure the designers thought of that. They look pretty stylish and unique though, but once again these appear to be a design concept rather than a finished product. Hopefully, by the time I need to wear glasses, these will be on the market. 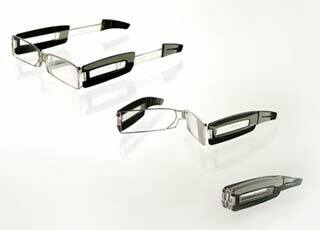 For more details on the Optigami folding glasses, check out RKS Design. I have searched the web, I cannot find anywhere to buy these, can anyone help.